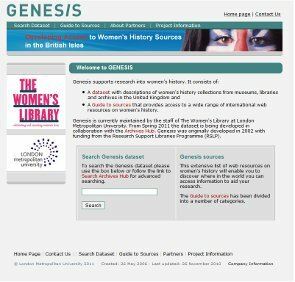 www.genesis.ac.uk is a website supporting women’s history and women’s studies users, from sources across the British Isles. 2) The Dataset – Catalogue descriptions relating specifically to collections by or about women. The Women’s Library is now re-launching the Dataset in collaboration with the Archives Hub. Originally comprising about 1500 descriptions from 46 partners, Genesis now has access to 180 partners and a similar increase in descriptions. But why re-launch? What’s so new? The plan has been to make Genesis more sustainable and to improve the quantity and quality of descriptions. This has been achieved by implementing a remote search of the Archives hub using a protocol called SRU, Search and Retrieve via URL. The user conducts a search on the Genesis website and all results and navigation are shown via Genesis. But unbeknownst to them, the User will really be searching seamlessly across the Archives Hub and its increasing number of contributing partners and Spokes. The way that this is achieved is by identifying a selected number of descriptions that are relevant for women’s studies. If a Collection is indexed in the Subject field with “women” or “women*” (i.e. “womens suffrage” “womens status”etc.) then it will be retrieved from the Archives Hub via Genesis. A subject indexing guide is available from the Archives Hub or Genesis. This method has many advantages. The User doesn’t leave the comfort of their own ‘Subject area’ or ‘Genesis brand’ but they benefit from the sustainability of having the descriptions on the Archives Hub. The Hub has benefitted greatly from gaining new contributors and new descriptions via the network of connections that The Women’s Library has with archive repositories. Genesis has always contained collection level descriptions from archives, libraries and museums. So users will also see some non-archive collection level descriptions creeping into the Hub, part of an increasing move towards cross-domain discovery. The collaborative work between the Archives Hub and Genesis is a great example of what the sector is looking to achieve: avoiding duplication of effort, seamless access to descriptions, working to achieve greater profile of archives, opening up data through the appropriate use of technology. All this at the same time as understanding that users often like a focussed search environment (as well as a Google type search environment). You can read the rest of this article including more about the project, the lessons learnt and the collaborative approach. The Women's Library, part of London Metropolitan University holds the most extensive collection on women’s history in the UK. The majority of materials cover women in the UK but there are some international materials. It covers a wide range of subjects: women’s rights, suffrage, sexuality, health, education, employment, reproductive rights, the family and the home. The collections contain scholarly treatments of the subjects but also biographies, popular works, government publications and fiction. Records for the collection of periodicals are also available which include suffrage periodicals, 2nd wave feminism publications and commercially published magazines from the nineteenth century 'English Women's Journal' to currently published magazines such as 'Marie Claire'. There are also records for journals from women’s organisations, networks and campaigns. Records available on Copac include those from some of the special collections. The Cavendish Bentinck collection has been donated by “outstanding women of their time” and shows the contribution women have made to literature and learning and the position of women throughout history. The Josephine Butler Society Library was built to support the campaigns against the state regulation of prostitution in the 19th century. It includes the society’s campaign literature and business papers, works on sexology and psychology and works on the trafficking and slavery of women.